This is a very unpretentious contemporary read. Written in varying styles of journal entry; the honest pictures that Moe, Tabitha, and Elodie paint of their lives and crimes make reading their stories a voyeuristic experience. These three voices speak to readers of lives spent playing roles based not on who they are, but on who they are perceived or expected to be. Tabitha-the rich princess with a black AMEX and not a care in the world. Elodie-the shy, timid, yearbook nerd. What everyone fails to see is who they really are, and that their true selves are total opposites of the masks they wear for family and friends. These are girls crying out for the excitement, honesty, and release that they only seem to get when they steal. That is...until they find each other. great review! 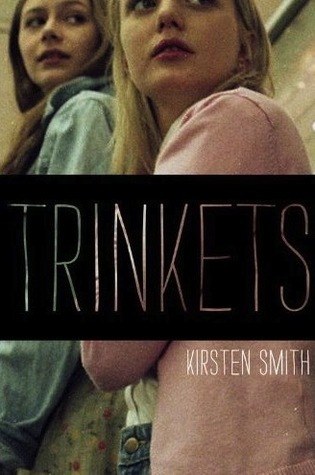 I've been trying to find some reviews of Trinkets and glad I found yours. Honestly the synopsis sounds a bit cliche with the misunderstood girls who their true selves are the opposite of what they portray on the surface but you seem to have enjoyed it this much, I might as well give it a try! I'm really excited for this one! I think a tale of heartwarming is just what I need. How have I not heard of this? I love the idea of a steal-off, which I'm sure is not going to end well for them. I'm definitely going to have to get myself a copy of this one, thank you for the recommendation! This book was not on my radar! TOO BAD! Must add it now, sounds wonderful! Great review. I never heard of this one! I will have to check it out. Thanks! Sounds really good and your calcification is perfect, so... I hope I could have it. I've never heard of this book, but it looks like something my middle schoolers would love. I haven't heard of this one yet but it looks awesome, and I love that cover! Thanks for the review!